We’re nearly there! Today’s submission means we’ve only got two more to go before we round out the top 10. 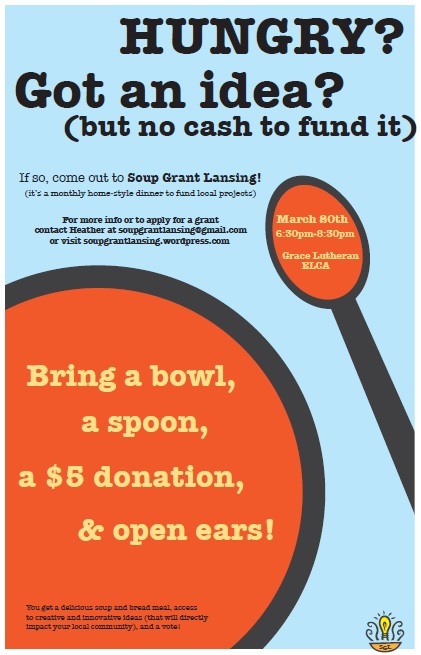 Voting is next Thursday (March 20) at SoupGrant. More details will be appearing very soon. Today’s submission comes to us from T. Joel Nys of Grass Lake (between Jackson and Ann Arbor). About the designer: I am a recent graduate with a degree in graphic design. Although I did not grow up in the area, I have become quite fond of Lansing and would like to positively impact the community using my design talents. About the submission: For the logo design I combined the literal with the figurative. I wanted to highlight thought, creativity, and innovation. I also wanted to give the logo a hand drawn feel to represent accessibility, and community. I created a logo that can stand alone or work with the logotype, so that it can be used across many different mediums. Want to be in touch with T. Joel Nys? Check out his website. You can also find him on Facebook and LinkedIn. If anyone is interested in my work, feel free to head over to my site(s) and get in contact. I am also looking for new projects to lend my talents to. Sorry we forgot to add that – I just updated the post with the links as well. Not a problem, thanks so much!